Born in Nice (France) August 5, 1968, at 4:30 am. It was a Monday. Suffice to say that it was necessary to immediately get to work ... Convinced to be French for 15 years, he discovered Italy the day he moved to Rome with his family. There he discovered literature, art, poetry. He moved to Brussels in 1987 and in 1989 founded the project "maelstrÖm," a multi-arts and multimedia project. Director of the magazine and maelstrÖm collection before they became fully publishing houses, screenplayer ("polders" real Claudio Serughetti. - Arte / Rtbf), co-founder of the poetic ReEvolution network with Lawrence Ferlinghetti, Antonio Bertoli and Alejandro Jodorowsky, he has long worked in the "homeless-help” field, in Brussels, as night educator and project manager as "word spaces for the homelesses." 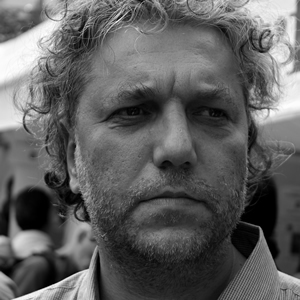 In 2007 he created the fiEstival, International Poetry Festival in Brussels and became director of the House of Poetry of Amay (Belgium) and Editions L'Arbre à paroles. In December 2010 he opened, in Brussels, the Bookstore maelstrÖm 4 1 4. He is also a poet, painter, performer and therapist. He has published comics scenarios ("The Far Side of the city," 3 vols. ), Poetry ("Opened eye Closed eye", “Faith, knowledge and remembering”) and a book of stories ("Tales of Nod"), all published in maelstrÖm Reevolution.